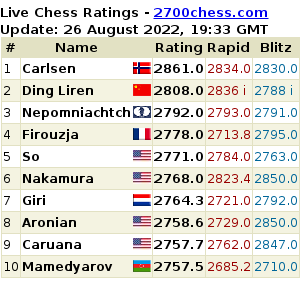 Valentina Gunina won her sixth game in a row in round 7 of the EIWCC. She leads the competition before the free day. As usually such winning series are supported with luck, this time fortune was on her side again. Black has been a bit greedy: instead of 40...Qxa3 more accurate was 40...e5! (with the idea of 41...e4), it still had a considerable advantage and eventually won 41.Qc4 Qb2 42.Qc5?! Rc2 43.Qb6 Qe5 44.b5? Qe1 45.Qd4 Rd2 46.Qf4 Rd1 0-1. 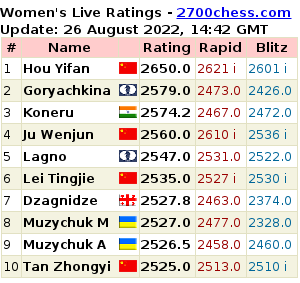 Lela Javakhishvili is second after beating another Ukrainian Mariya Muzychuk. 35...Kh7? (there still was a way to defend by taking control over g7 square, and still it could only work in case of precise play by Black and inaccurate play by White, which is quite hard to imagine if taking into account time trouble Muzychuk was experiencing by this time): 35...Rd7! with the following idea 36.Kh2 Qa4) 36.Kh2 Rc8 (36...Qa4? is weak because of 37.Ne6) 37.Rd2 Rc7 38.Rc2, and White converted the advantage (1-0, 53). One another Ukrainian Inna Gaponenko also lost today against Betul yildiz, now she has 3.5 points/7. Recently leading Nana Dzagnidze lost another game, this time against Tatiana Kosintseva. Last year's champion drew her game. 31...Qh5!, and Black maintained equaility: 32.gxf6? gets a check from g3 with losing the queen. In general well played game by both players (draw, 41).